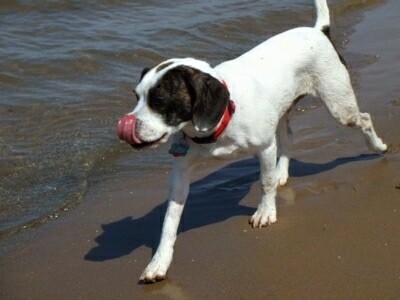 Buddy the Frengle (Frenchie / Beagle mix) at 2 1/2 years old at the lake— "This little Frengle has got quite a fun-loving personality. He loves to go for walks; we try and do a 45-minute walk every other day. 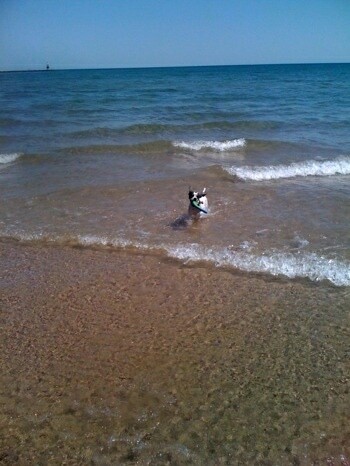 In the summer he loves to go for a quick swim at the lake. As soon as he gets home, he turns into a couch potato. 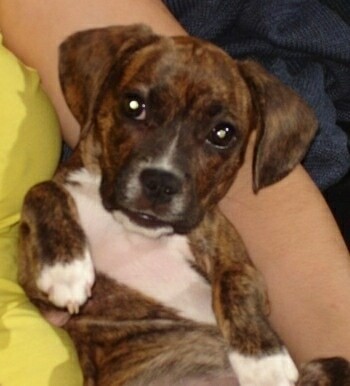 This little love bug is eager to snuggle up to you when you're watching TV or reading. He loves people and other dogs...really enjoys giving kisses to kids. He only has one enemy and that's our vacuum (the sounds really upset him). Although he'll be 3 at the end of October, he's still looks like a puppy. He didn't get the Beagle appetite...he's never been a big eater. He's 28 pounds of pure happiness and is always there to cheer you up when you're having a rough day." The Frengle is not a purebred dog. It is a cross between the Beagle and the French Bulldog. The best way to determine the temperament of a mixed breed is to look up all breeds in the cross and know you can get any combination of any of the characteristics found in either breed. Not all of these designer hybrid dogs being bred are 50% purebred to 50% purebred. It is very common for breeders to breed multi-generation crosses. 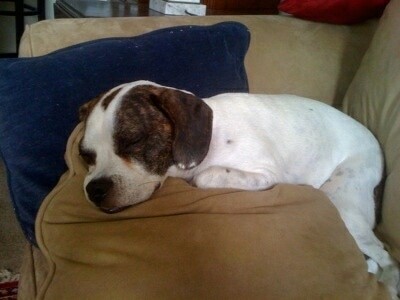 Buddy the Frengle (Frenchie / Beagle mix) at 2 1/2 years old sleeping on the sofa. 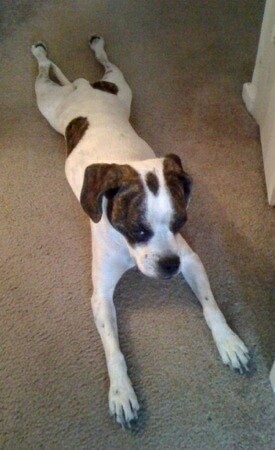 Buddy the Frengle (Frenchie / Beagle mix) at 2 1/2 years old stretched out on the floor. 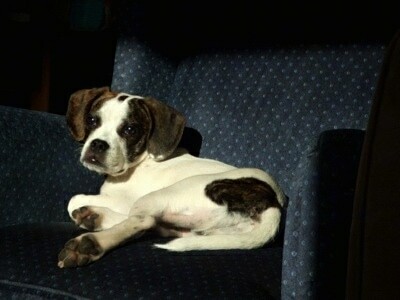 Buddy the Frengle (Frenchie / Beagle mix) at 2 1/2 years old resting on the chair. 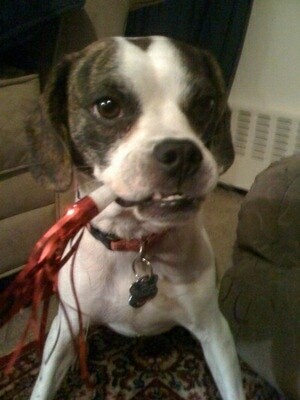 Buddy the Frengle (Frenchie / Beagle mix) at 2 1/2 years old ready to party. 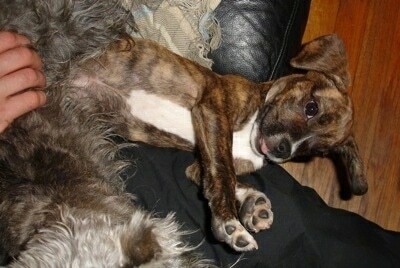 Buddy, the French Bulldog / Beagle hybrid (Frengle) puppy at 10 weeks old scratching himself. Buddy, the French Bulldog / Beagle hybrid (Frengle) puppy at 10 weeks old enjoying his bully stick. 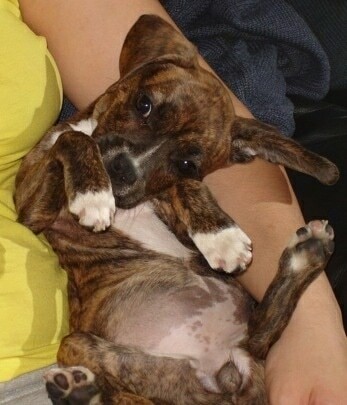 "Abbey is a Frengle (half French Bulldog / half Beagle). She is 10 months old in this picture. She is a very loving, active, fun-loving dog. She is the most popular dog in the dog run (popular with the dogs and people). She has no fear and thinks life is only fun and games. She has no fear and does not know how to get mad. She will run around the park chasing other dogs and wrestling for the full hour and a half that we spend there. She weighs 23 pounds and will play with toy Pomeranians (that weigh nothing) and Great Danes (about 8 times her size). Although she is a very active dog when we are out, at home she loves to snuggle and curl up in the bed with you. I live in New York City (in a tiny apartment) and she goes outside at least 3 times a day (45 minutes in the morning, 1.5 hours after work, and a 10-minute walk before bed). 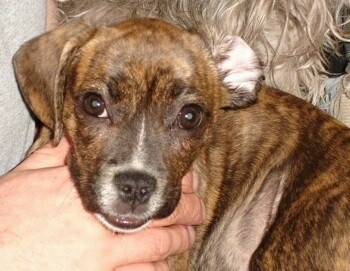 Abbey is a lot of joy to have; my only problem with her would be her chewing or the things she likes to chew. She seems to love to chew leather and fuzzy things. Abbey does not bark at home, only when we are at the dog run and she is trying to get another dog to give her some attention/play with her. Sometimes at night or early in the morning I hear her snort in her sleep. I love the Frengle; you just have to make sure to give them enough exercise." 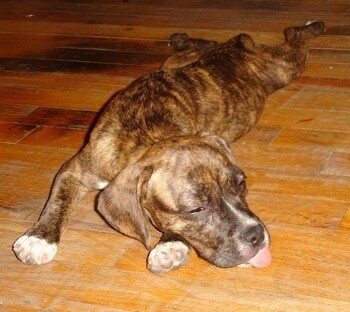 Abbey the brindle Frengle (half French Bulldog / half Beagle) at 10 months old stretched out on the floor with her tongue sticking out.